Tottenham are in action against West Brom at White Hart Lane on Monday night and they desperately need a victory to keep the pressure on league leaders Leicester. This article contains our TOTTENHAM v WEST BROM betting preview with predictions, betting tips, enhanced odds, probable line-ups, exclusive promotions and no deposit bonuses on the Premier League! Spurs are 8 points off Leicester with this game in hand as the Foxes have hammered Swansea 4-0 yesterday. Tottenham have notched up two convincing straight wins, first 3-0 against Manchester United and 4-0 against Stoke City. They are unbeaten in their last 7 matches at home, with 6 wins and a draw. Furthermore, Tottenham have scored the most goals in the Premier League this season (64) and have the best defensive record, having only conceded 25 times in their 34 matches. Nabil Bentaleb continues his recovery from injury and he is the only player missing for Mauricio Pochettino as Clinton N'Jie is closing in on a return to fitness and could make the bench. The Argentina manager should field hus typical starting Xi. The only real possible question mark is on the right flank, though it would be a major surprise if Erik Lamela didn’t start ahead of the likes of Nacer Chadli and Heung-Min Son. West Brom are on a downhill ride and lost each of their last three games. They suffered a 2-0 defeat at Arsenal on Thursday. The Baggies are playing like a team that has one eye on their summer holidays given that they are already safe from relegation as they just need a point from their remaining 4 matches to ensure they stay in the top flight next season. Only Aston Villa have scored fewer than WBA's 31 league goals this season, but they have only conceded 42 times, which is a better record than both West Ham and Liverpool. Chris Brunt and James Morrison remain sidelined for the Baggies, while loanee Alex Pritchard is ineligible to face his parent club. Tony Pulis could hand recalls to Salomon Rondon and Craig Gardner for the trip to White Hart Lane. That would mean Saido Berahino returning to the number ten role, allowing Rondon to lead the line. At the back, Jonas Olsson is expected to partner Gareth McAuley at the heart of the defence, with Jonny Evans moving to left-back with Craig Dawson retained on the right. The two teams played out a 1-1 draw at The Hawthorns in the reverse fixture earlier this season, while the Baggies won 1-0 at White Hart Lane last term. Indeed, West Brom have lost just once in their last five league visits to White Hart Lane (W1 D3 L1). West Brom (4-5-1): Foster; Dawson, McAuley, Olsson, Evans; Fletcher, Yacob, Gardner, Berahino, Sessegnon; Rondon. Enhanced Odds! 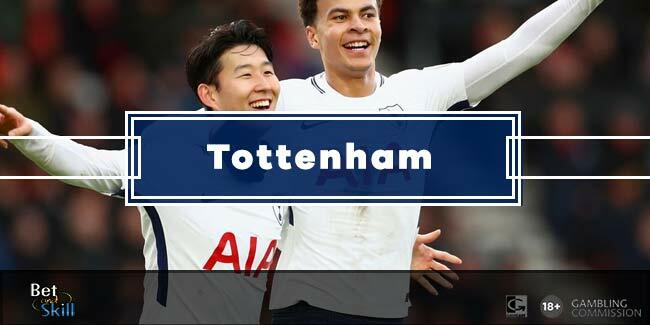 4/1 Tottenham to win + £100 bonus! Risk-free! Crazy boost! Get 20/1 Dele Alli to score first! Enhanced Price! Get 4/1 Tottenham to beat WBA! "Tottenham v West Brom predictions, betting tips, odds and lineups (Premier League - 25.4.2016)"